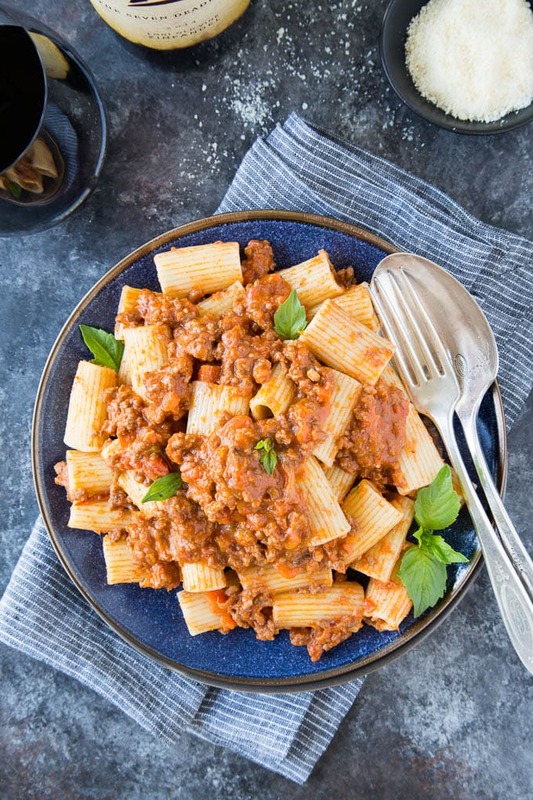 Crockpot Bolognese Sauce – Wondering how to turn a package of ground beef into something extra delicious? Combine with onions, garlic, carrots, celery, San Marzano tomatoes and a touch of wine in the slow-cooker and let it simmer all day. You’ll come home to a thick and rich Italian Ragu style sauce that can be served over your favorite pasta, spaghetti squash, zucchini noodles or polenta. 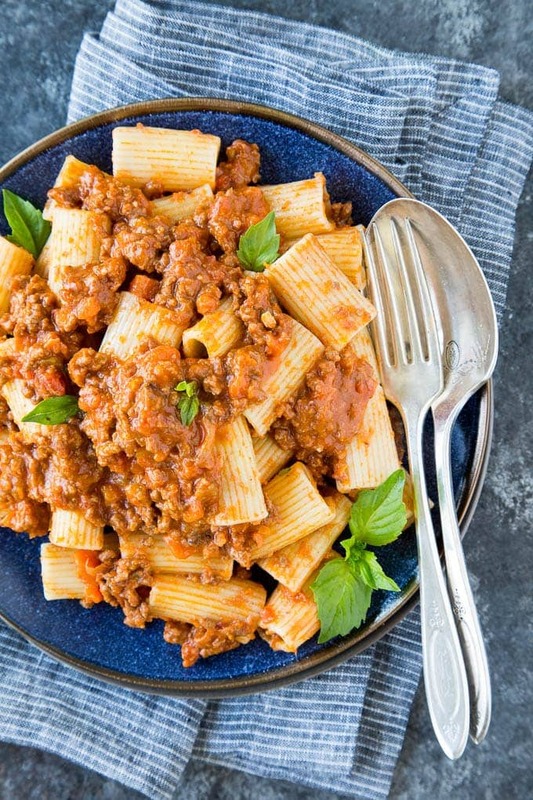 The secret to a good Bolognese sauce is letting the ingredients simmer over low heat all-day. This is one of those recipes that is perfect for making in a crockpot/slow-cooker! No need to slave over the stove, stir the sauce a bazillion times, or even be present in the kitchen. The crockpot does all the work! OK..let me rephrase that, the crockpot does 99% of the work. I do think this recipe works best when the lean ground beef is sautéed (along with the onions, carrots and celery) in a skillet prior to adding to the crockpot. Cooking the meat before adding it to the crockpot allows the meat to get a bit carmelized (tastier!) and also allows you to drain any fat prior to making the sauce. The only other prep that requires hands on time is dicing the onion, carrots and celery. You’ll want them to be finely diced and fairly uniform in size. Time saving option: look for pre-cut vegetables at your local grocery store (You’ll need approx.1 cup of each-onion, celery, carrots). 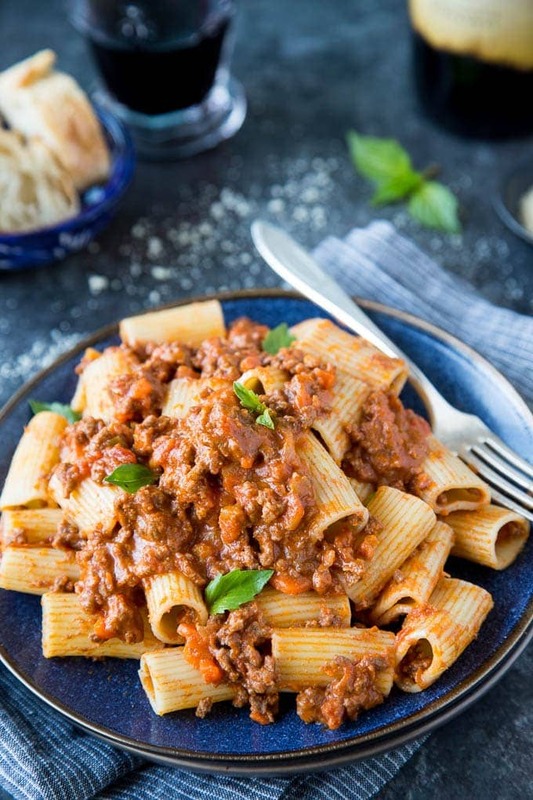 Bolognese sauce is traditionally served over pasta. I particularly like it served over rigatoni (all those fabulous ridges for the sauce to cling to! ), penne, or pappardelle. For a gluten-free option serve over creamy polenta. If you’re looking to keep things lower carb try Bolognese sauce over zucchini noodles or spaghetti squash. Crockpot Bolognese sauce is easy to freeze. You may want to consider making a double batch and having some for dinner now and freezing some for easy weeknight meals later. Heat olive oil in a large skillet over medium-high heat. Add onions, garlic, carrots and celery; cook until onions become translucent (about 6-7 mins.) . Add beef and season with salt and pepper. Sauté until browned. Drain fat from pan and add wine, scrapping the brown bits from the bottom of the pan. Continue to cook until wine reduces (about 3-4 mins). Depending on the size of your skillet it may be necessary to cook meat in batches. Add beef mixture, tomatoes and beef stock to crockpot. Set crockpot to “LOW” and cook for 6 hours. After 6 hours, taste and add salt/pepper if necessary. Stir in half & half and serve over your favorite pasta, spaghetti squash or zucchini noodles, or over polenta. Garnish with fresh grated Parmesan cheese and chopped Italian parsley.